I wanted to try something new…more on the whole food option. It should be healthy vegetarian dish. I saw this recipe on Food Food Tv channel, as it was a healthy dish and so end of it, I decided to give it a try. 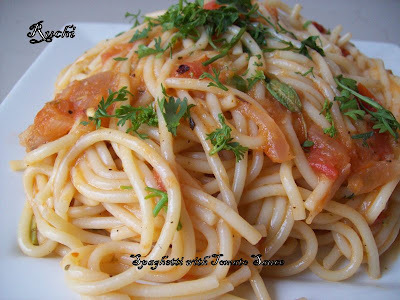 It came out very well at my first try, it is really simple and tasty dish and Content of this recipe is light; Fresh tomatoes and basil, mixed with all sorts of goodness, delivered a wonderfully clean taste. 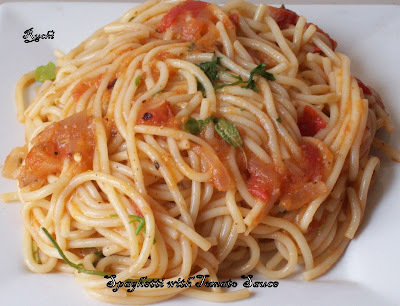 I have become a fan of the deliciousness of this spaghetti with tomato sauce. Cook the tomatoes in a pan. Add the clove of garlic, onion and bay leaf to it. Add water and then season with salt and sugar. Cover and let the tomatoes boil. Cool and then grind to a puree. Now in a separate pan, heat oil and add cooked peas ,chopped onions and chopped garlic. Add the tomato puree. Cook till its reduces to half. Add basil leaves and mixed herbs keep aside. 1.Bring a pot of salted water to a rolling boil, and add the whole wheat spaghetti to it. Cook it uncovered until done.Usually it will cook about 12 minutes, but whole wheat can take longer, depending on the brand. 2.While the spaghetti is cooking, start the sauce. 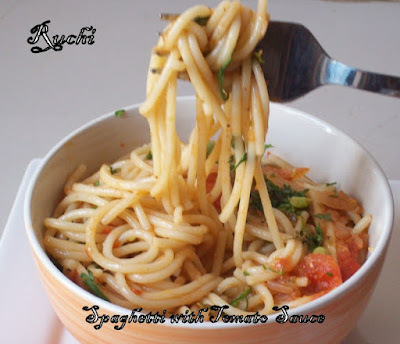 5.Add spaghetti and serve in a bowl, Feel free to spice it up with herbs , basil and coriander.